Wellbeing isn’t all about fancy green smoothies and yoga headstands. Sometimes keeping it simple is the easiest way to improve our wellbeing, as mastering new habits isn’t always easy. As we create new habits, we are creating new connections and pathways in our brains – which is why it can feel so hard at the start! However, creating new habits to improve wellbeing doesn’t need to be hard work. While some things are harder to master than others, there are also some super simple steps you can take to improve your wellbeing and today I’m sharing five you can start doing today. 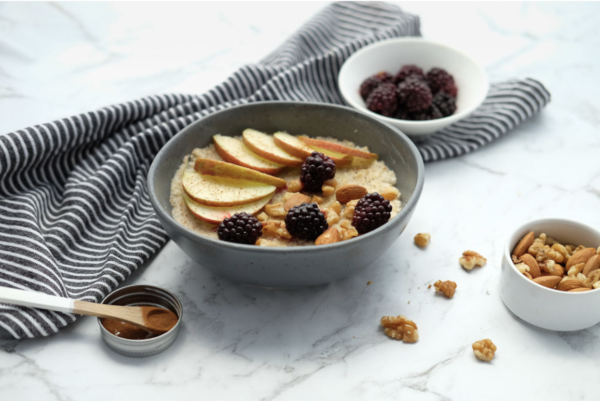 I’m definitely an oats girl – I love a big hot bowl of porridge in the winter and then I like to make my own muesli in the summer. If you need to keep an eye on your cholesterol levels, then Harraways Oat-activ® can help! Oats naturally contain beta-glucan, a compound that can help lower cholesterol. But you have to eat a lot of oats for it to have a significant effect. That’s where Harraways Oat-activ® comes in. They have been specially designed to help lower cholesterol with the addition of natural plant sterols. Combined with beta-glucan, the combination of these two active compounds can help reduce LDL cholesterol with just two of the sachets a day as part of your daily intake of 3g beta-glucan, or 2g of plant sterols. LDL cholesterol is the type that can be deposited in your arteries if it’s too high and it’s a risk factor for developing cardiovascular disease. If you’re unsure about your cholesterol, your GP can have it tested for you. I’ve been eating the sachets as porridge or bircher as breakfast or snacks, but you can also add it to smoothies too. You can get it in two flavours – original and cranberry, available in selected Pak N Save and New World supermarkets. I think that’s a pretty tasty way to help lower your cholesterol! As someone who can struggle with anxiety, deep breathing is one of the tools in my toolkit for self-care. Who would have thought that something as simple as deep breathing could have such a positive effect on your wellbeing? 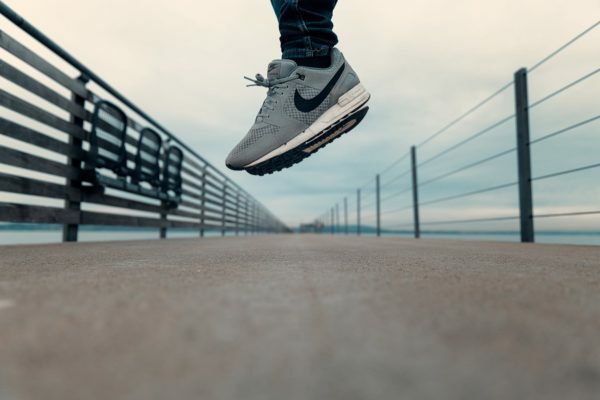 Deep breathing triggers the parasympathetic nervous system to counteract your body’s ‘fight or flight’ response – those feelings that give you a racing heart and leave you feeling on edge. It helps slow your heart rate, can decrease blood pressure and decrease stress hormones by 33%. Pretty impressive for something that you can do anywhere, anytime and at no cost! I find it really useful at night when I can’t go to sleep – it really helps me relax and often before I know it, it’s the morning and I’ve fallen asleep. You can learn more about how to practice these techniques here. Mindful eating is a powerful way to think about food that helps you tune into your body and remove judgement around what and how you eat. 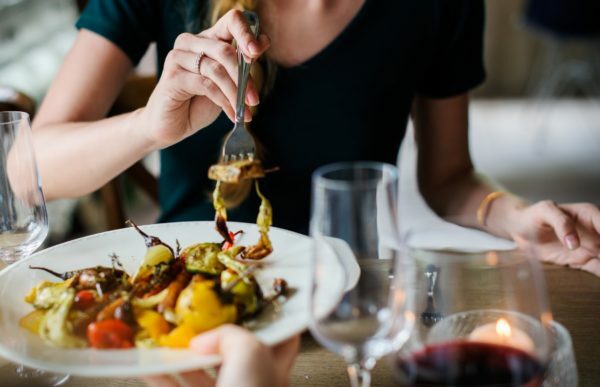 Mindful eating encourages you to listen to what your body is telling you before, during and after your eating experience. It’s about being in the moment, paying attention to your body and being curious rather than judgemental. So what does it actually mean? In a nutshell, it means paying attention to your hunger levels and to what you feel like eating; noticing when you’re satisfied and noticing how the food has made you feel. All with a non-judgemental viewpoint. By being more in tune with our eating experience we’re more likely to be satisfied, and make decisions that make our bodies feel good. If I say gut health, I bet you automatically think of fermented foods and probiotics. While these do have their role in gut health, we tend to forget the not so exciting prebiotics. Prebiotics are a type of dietary fibre which provide the fuel for the good bacteria in your gut. This then helps the bacteria produce nutrients which are used by parts of your gut to help keep it healthy. So by eating a variety of plant-based foods such as vegetables, wholegrains, legumes and fruit you’re helping keep those bugs fed and healthy. Legumes and wholegrains have been given a bad wrap by some groups (I’m talking to you paleo….) but not only are they nutrient dense, they’re also good for your gut bacteria. That’s right – it’s time to throw away the scales. For so many people, weighing themselves is a cause of anxiety and stress, and that number in the morning dictates the whole tone of the day. Instead of worrying about the number, focus on your wellbeing by creating healthy habits- that’s what matters. Thanks to Harraways you could win a two month supply of Oat-activ®. That’s 4 boxes of the Original and 4 boxes of the of the Cranberry flavour. To be in the draw to win, let me know in the comments below, your favourite way to eat oats. Competition closes (extended! ): 6 May 2018 Winner announced: 7 May 2018. Competition open to New Zealand residents only. I make my own bircher for the week on Sunday nights and it stays good all week! 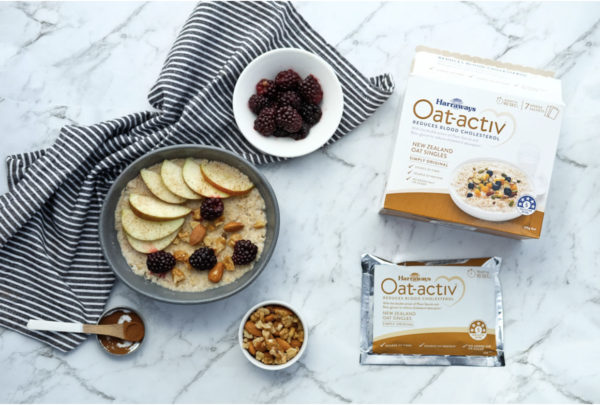 Harraway’s oats are so versatile and although i have not tried Oat activ i’m certainly keen esp to help lower my cholesterol. My favourite is with hot pan boiled milk with a little cinnamon. I love oats mixed with chia seeds and nuts, soaked overnight in almond or soy milk, topped the next day with fresh fruit and coconut yoghurt. Soooo yummy! I would be split between porridge and Anzac biscuits ? Overnight oats with rhubarb or baking like date and oat brownies! With Greek yoghurt, sprinkling of chips seeds and LSA, few raisins or cranberries chucked on top if it’s porridge or chucked in the blender as part of my smoothie. I love for breakfast in summer an oat bircher muesli soaked in almond milk overnight, then served the following morning with a piece of fresh fruit and a dollop of greek yoghurt. As porridge, with raspberries and some cream. I use them all the time but I love porridge with a good teaspoon of hazelnut butter and a scoop of vanilla latte protein powder! I have porridge every day in the winter and never get sick of it! I enjoy frozen berries on top during the week, and maybe a little chocolate shaved on top at the weekend! I love making porridge with oats . I add grated carrot and use almond milk and too with nuts and cinnamon. Yum ? I love my oats with some green kiwifruit and plain Greek yoghurt – yum!! I can’t decide whether my favourite is Homemade muesli with nuts and seeds or Bircher muesli with grated apple. Oh and porridge with stewed fruit and almonds in winter. Love wholegrain oats! My Pops porridge was amazing maybe had something to do with brown sugar & cream ? my rugrats & I love stewed apple on ours from our tree yummy! Warm with Greek yoghurt and and blueberries in winter and in homemade tasted museli in summer. Yum! I love adding peanut butter and stewed apple to my porridge, keeps me full for hours and it tastes amazing!!! With cinnamon & a little bit of brown sugar ? Current fav is overnight oats with peanut butter (pics!) and blueberries. Vegan overnight oats-with chia seeds, medjool dates, a ripe banana and fresh fruit on top! Great to take to uni when I have a long day of studying ahead! 🙂 Oh, and Pic peanut butter of course! I enjoy eating my’Breakfast Oats’ knowing that it’s doing its’ thing to reduce my (slightly high) cholesterol levels. But I really love to put it into Fruit Crumble. I serve dessert most nights if the family are here. .One night I make Seasonal Fruit Salad. (At present that’s apples, pears, kiwifruit and blueberries) I make plenty so that there’s some for my Breakfast Oats next day. Then I top the rest of the Fruit with a really Oaty Crumble mix. Bake. Serve with yoghurt. Yum! My favourite way is to soak them in almond milk overnight with chia seeds and enjoy them the next morning with peanut butter and fresh banana! overnight oats by far! 1/2 cup oats, 1 cup of almond milk, dash of sugar free maple syrup and some berries YUM! Love mine cooked and topped with yoghurt, nuts and seeds ??? I love my porridge with brown sugar & warm milk or with a topping of apples or bananas. Yummy! We love eating oats in energy slice- with lots if different seeds, a little dried fruit, a smidge of honey and some coconut. Really delicious for the whole family at morning tea. Bircher muesli in summer and porridge with grated apple and cinnamon in winter ? Porridge! Oats, water, coconut milk, mashed bana, topped off with almond butter and blueberries! I made my son some warm porridge with dates cooked in to the mix. He then stirred in some chia seed, coconut and cacao mix to make it chocolatey. He absolutely loved it like this. He sometimes also adds a sprinkle of beetroot powder to make it red. When I eat oats I like to have them as a bircher muesli. They can be mixed easily with amareth, buckwheat and millet with LSA and pumpkin seeds, fruit, ginger and cinnamon. I love porridge. I like a small bit of maple syrup for sweetness and a bit of milk on top. Sultanas are yum stirred in for something different. I enjoy oats in the base of ginger crunch. I eat porridge every morning, with plain yoghurt which has protein powder stirred through and frozen berries. Delicious. Porridge with blueberries, sprinkled with cinnamon. Yum! I love making homemade muslei with Harraways organic oats, seeds, almonds and honey. Can’t beat Harraways. Over night soaked in water, oats, oatbran and chia seeds. Cooked with a grated pear. Served with Kefir and plain yoghurt on top, sprinkle of granola. I love oats in porridge with a spoonful of honey! It’s a great way to start the day and keeps me going! I love my oats with Greek youghart,pumpkin seeds, cinnamon and ginger. Delish. I love my oats as porridge with Greek yogurt and fresh or dried fruit. I also love to make up my own toasted muesli with dried fruit, nuts and honey.